Da Nang (VNA) – A working team from the Ministry of Health led by Vice Director of the Preventive Medicine Department Dang Quang Tan inspected the prevention and control of dengue fever in the central city of Da Nang on August 4. The team advised the city to pay greater attention to killing mosquito larva in the community and spraying chemicals in areas of high risk, while raising public awareness of the work. Da Nang should also encourage locals to go to health facilities immediately after they find any dengue fever symptoms. At the same time, the team also asked the municipal Health Department to roll out stronger measures against diseases and pandemics, especially dengue fever. 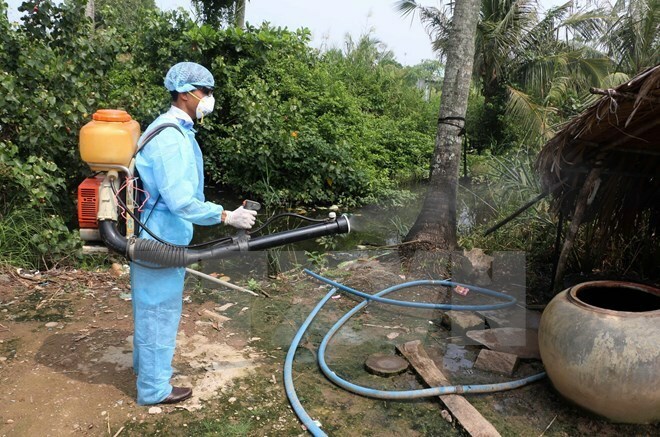 According to the Da Nang Health Department, since the beginning of this year, the city has recorded 3,800 dengue fever cases, up 85 percent over the same period last year. The unusual weather condition with high humidity was one of the reasons behind the spreading of the mosquito-borne virus.